Our fun knitting group is located in Peoria, Arizona. We get-together usually about once a month or so., bring our knitting projects and share ideas as well as teach new ones. We are made up of many ages from young to retirees. We bring snacks and of course some great tasty wine, (for adults only) oh, and of course some laughable jokes and stories to share. 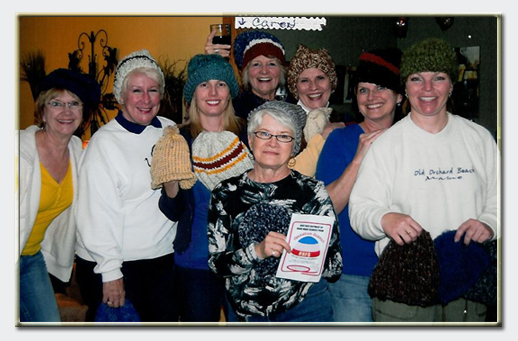 Please accept our beanies to include in your next shipment, along with this photo of some of our group. Each one is different and made with our men and women in mind who are serving our country from near and far. Our Blessings and Safe Keeping are sent with each new Beanie!